Should I call this a facebook moment? My husband is a heavy smoker. He smokes a packet of tabacco a day. He never gives up smoking no matter how much I beg for it. One day he applied for a prize by Japan Tabacco, Inc. We all forgot about that, but today, to our great surprise, he got a call from JT, and it said that he won the prize! 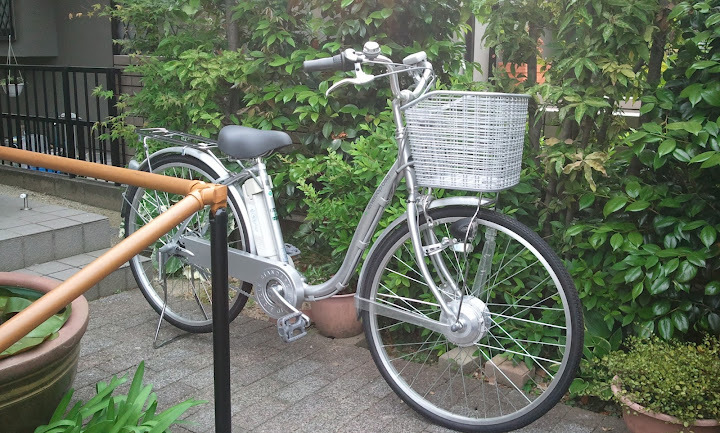 Soon an electric bicycle was sent to our home. I think this is the first time for me to get something as a prize. All my family tried riding the bicycle in turn. It was good. I felt as if someone had helped me peddle it from behind. My husband boasted and boasted. He said "Now you know something good can happen from smoking." Oooooh, it looks as if this prize gave him a right to smoke without any constraint. He also said "It seems I'm getting more and more luck these days. It may be time to buy a lottery." Wow, now is he going to buy a lottery, too? I said, "Why don't you think other way round? You might have used up all the luck you have in your whole life time." He said, "Why do you think so negatively? A positive person will get good luck. You should always think positively." Mom said, "Maybe God has given us this bike so that we can get good exercise." She is right. I'm going to use this bicycle and get some good exercise.